The casts of Real Housewives of Dallas, Southern Charm, Fashion Police, and Famously Single were front and center at the NBC Summer Press day, held on the West Coast. NeNe Leakes and Melissa Rivers were there representing for Fashion Police while Brandi Glanville, Somaya Reece and Aubrey O’Day were on hand for their new E! show, Famously Single, which finally got a premiere date of June 14th. Also there to promote the newest Real Housewives franchise: The Real Housewives of Dallas cast members Cary Deuber, Stephanie Hollman, Brandi Redmond, Tiffany Hendra, and LeeAnne Locken. RHOD kicks off on Monday, April 11th. Check out the red carpet pics below! Tell us who makes the best dressed list. NeNe Leakes doesn’t often give in-depth interviews, but when she does – she goes all out to clear the air! The Real Housewives of Atlanta star addressed everything from the Wendy Williams beef to the current rumors that she’s being a diva on the set of Fashion Police. Oh please make it stop. Enough already! As if the Kardashians haven’t tainted every imaginable aspect of pop culture, momager Kris Jenner is taking a break from her daughters’ careers to work on her own. Thanks, E! What dirt do these folks have the the network’s higher-ups? That’s what inquiring minds really want to know! The Keeping up with the Kardashians matriarch wants to remind us (yet again) of how hip she is to all things current…especially fashion. After all, her son-in-law is Kanye West, and the man can design track wear with the best of them, right? I don’t have the evens to can’t at the moment. While in New York City for Fashion Week, NeNe Leakes stopped by Extra to chat with AJ Calloway. The former Real Housewives of Atlanta star dished on her recent cameo on the Real Husbands of Hollywood, the ‘thirsty chicks’ on RHOA, and her stint on Fashion Police. NeNe Leakes On Cynthia Bailey’s Problems, New Jobs, Bad Wigs, And Compares Herself To Joan Rivers! NeNe Leakes has the same question we all do: What is going on with Cynthia Bailey? But while we are pondering this, she has other things to do, like her NEW J-O-B-S. 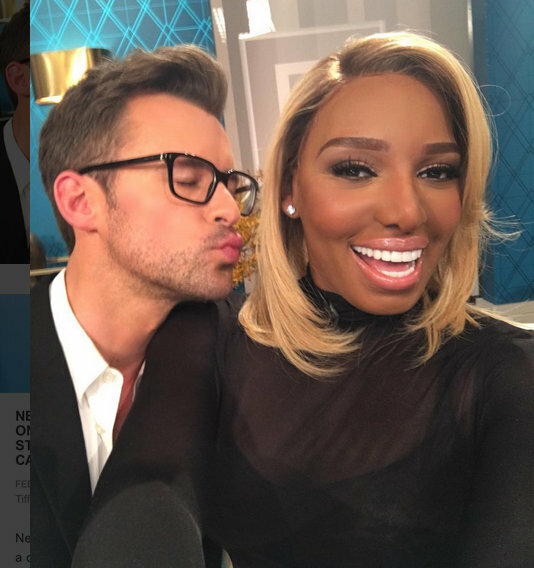 Yes, of course, NeNe is making that money with a new role on Oxygen and possibly a spot on Fashion Police as the new Joan?! But, first of all, NeNe has concerns. Why are some Real Housewives Of Atlanta stars are so bothered by her supporting Phaedra Parks through a difficult time? “What is the problem with me being there for Phaedra during a rough time in her life? I’m not there bashing her other friendships,” NeNe declares.